Following a stitch diagram in crochet isn’t that scary once you understand the symbols and abbreviations. 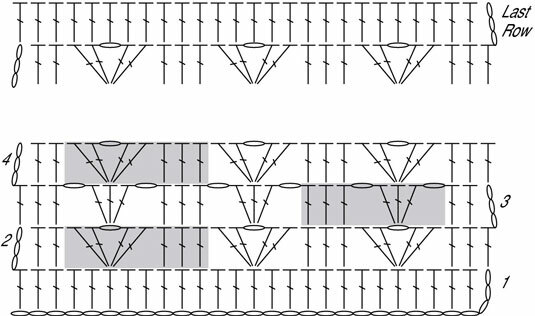 When you read a crochet pattern, the stitch diagram shows only a few rows to avoid repetition and save space. You work it in identical rows consisting of repeated sets of crochet stitches. The pattern tells you how many rows to make to complete the piece. When working in rows, the right side row number is placed on the right-hand side of the diagram, which means you work from the right side to the left side. On wrong side rows, the number is on the left-hand side, so you follow the diagram from left to right. When working in rounds, you read the diagram counterclockwise, without turning between rows unless the instructions specifically instruct you to do so. Left-handed crocheters go in reverse. Stitch diagrams are generally laid out from the right-handed crocheter’s point of view, but a left-handed crocheter can read them just as well if he or she reverses the direction of the pattern, and works from left to right instead of right to left. To work in rounds, a lefty still follows the pattern counterclockwise, but works the piece clockwise, thus reversing the direction of the pattern. Make a foundation chain (represented by the row of oval chain stitch symbols) that’s about the width you want. Make sure it’s a multiple of 8 stitches (to allow for the repeat). Chain 2 more stitches for the end of the row plus 3 more for the turning chain for the first double crochet of Row 1. For example, you could start with 21 chain stitches (2 x 8 + 2 + 3 = 21) or 85 chain stitches (10 x 8 + 2 + 3 = 85). This means to double crochet stitch in the fourth chain from the hook, double crochet in each chain going across, and then turn. Row 2: Ch 3 (turning ch for first dc), dc in each of next 2 dc, skip next 2 dc (2 dc, ch 1, 2 dc) in next dc, skip next 2 dc, dc in each of next 3 dc , rep from to across, ending with last dc of last rep in top of turning ch, turn. For Row 2, chain 3 to make the turning chain for the first double crochet stitch and double crochet in each of the next 2 double crochet stitches. For the repeated part of this row (the instructions shown between the bullets), skip the next 2 double crochet stitches, work 2 double crochet stitches in the next double crochet, chain 1, work 2 more double crochet stitches in the same double crochet, skip the next 2 double crochet stitches, and then work 1 double crochet in each of the next 3 double crochet stitches. Repeat this section until you reach the end of the row, ending with a double crochet in the top of the previous row’s turning chain. Turn your work. Row 3: Ch 3 (turning ch for first dc), dc in each of next 2 dc, ch 1, skip next 2 dc, 3 dc in next ch-1 space, ch 1, skip next 2 dc, dc in each of next 3 dc , rep from to across, ending with last dc of last rep in top of turning ch, turn. Chain 3 for your turning chain and then work 1 double crochet stitch in each of the next 2 double crochet stitches. For the repeated part of this row (the instructions that are shown between the bullets), chain 1, skip the next 2 double crochet stitches, work 3 double crochet stitches in the next chain-1 space, chain 1, skip the next 2 double crochet stitches, and then work 1 double crochet stitch in each of the next 3 double crochet stitches. Repeat this section until you reach the end of the row, ending with a double crochet in the top of the previous row’s turning chain. Turn your work. Row 4: Ch 3 (turning ch for first dc), dc in each of next 2 dc, skip next 2 sts, (2 dc, ch 1, 2 dc) in next dc, skip next 2 sts, dc in each of next 3 dc , rep from to across, ending with last dc of last rep in top of turning ch, turn. Chain 3 for your turning chain and then work 1 double crochet stitch in each of the next 2 double crochet stitches. For the repeated part of this row (the instructions that are shown between the bullets), skip the next chain-1 space and the next double crochet stitch, work 2 double crochet stitches, chain 1, work 2 more double crochet stitches into the next double crochet stitch, skip the next double crochet stitch and the next chain-1 space, and then work 1 double crochet stitch into each of the next 3 double crochet stitches. Repeat this section until you reach the end of the row, ending with a double crochet in the top of the previous row’s turning chain. Turn your work. Rep Rows 3–4 for desired length. Repeat Row 3, then repeat Row 4, alternating these two rows until your piece is as long as you want it to be. Last Row: Ch 3 (turning ch for first dc), dc in each st and space across, ending with dc in top of turning ch. Fasten off. Begin the last row from the right side, chain 3 for your turning chain and then work 1 double crochet stitch in each double crochet stitch and each chain-1 space across the entire row. 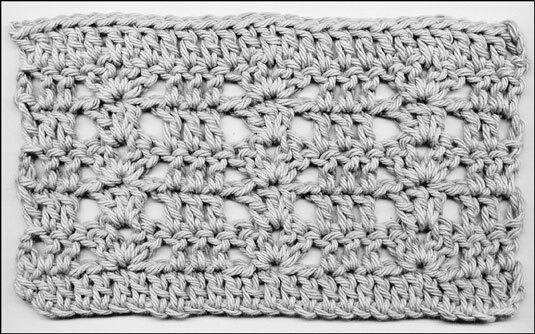 You should have the same number of double crochet stitches in this row as you have in Row 1. Fasten off your work, and enjoy your pretty swatch.